EW have released a new 'Fall Movie Preview' issue of their magazine, and of course, Mockingjay Part 1 has a small feature, with a new still of Katniss, and some words from Francis Lawrence. Over the course of the two Hunger Games films, Katniss Everdeen (Jennifer Lawrence) has been unflinchingly confident. But in Mockingjay - Part 1, the teen heroine suffers a bout of age-appropriate angst as she reluctantly becomes a rebel leader. "It's a very confusing, conflicted, complicated time for Katniss," says Francis Lawrence, who also directed 2013's Catching Fire. She's distraught, confused, angry." He won't reveal how he's divided the final book in Suzanne Collins' trilogy, but expect the addition of power-hungry President Alma Coin (Julianne Moore) to keep tensions high. "There's more of her than in the book," he notes. Here's how Katniss comes into her own. Mockingjay introduces a more sombre colour palette in its new costumes and locales, including rebel headquarters in District 13. "You're sort of hit with the harsh reality of the consequences of war," director Francis Lawrence says. After shooting the Hunger Games movies, Jennifer Lawrence has become quite the archer. "She didn't have to practice too much," says her director. True to Suzanne Collins' novel, it's Jeffrey Wright's Beetee who designs Katniss' new arrows with special explosive capabilities. Katniss dons sleek body armor with protective boots, knee and elbow pads, and a tailor-made chest plate that sparkles with an iridescent indigo sheen recalling the feather-trimmed gown she wore in Catching Fire. 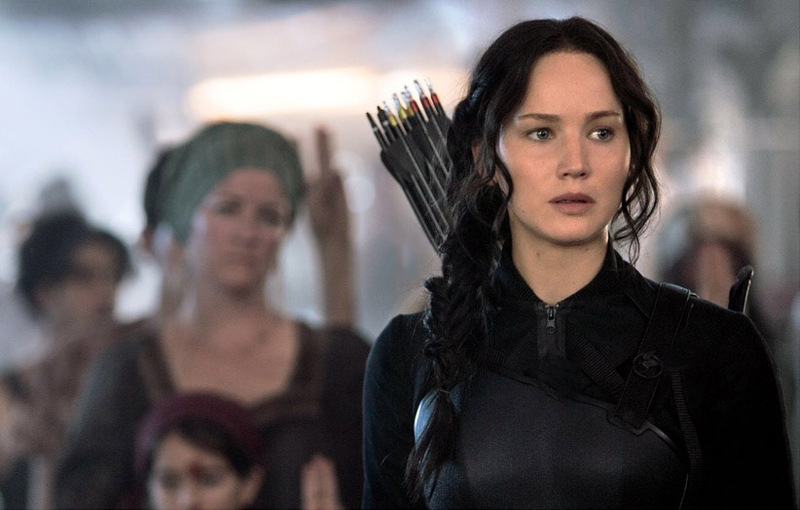 "It's the warrior version of her mockingjay look," says the director. Katniss' trademark gold-plated mockingjay pin has been exchanged for a new black-on-black token. "Stylistically, this is something that Cinna designed for her before he was beaten in Catching Fire," Francis Lawrence says. The magazine hits newsstands in the US tomorrow, and the digital issue is available now. Many thanks to mockingjaysource for the scans!